You've dusted off your coats, ordered a flavoured latte (even though you don't really like them but feel obliged to drink them because it only happens once a year) and suddenly you've started a conker collection. It's here. Autumn has well and truly arrived and we've kicked it off in style with some incredible live shows. Here's what September looked like across the country. What better way to welcome in the new Twenty One Pilots Trench era than with a fan-only, intimate performance at O2 Academy Brixton? Having instantly sold out most of their arena tour for next year, the genre-defying duo just couldn’t wait that long to perform the new material. With fans queuing for days before the show started, adorned in green and yellow to match the band, it was evident this was going to be something very special indeed, and we weren’t wrong. As a burnt-out car blew up in flames from the back of the stage, through a haze of smoke we saw drummer Josh Dun take to his platform, whilst Tyler Joseph kicked off the night with the opening bassline from ‘Jumpsuit’. This was just the beginning, though, the rest of the set saw backflips off pianos, CO2 cannons galore and Tyler running up to the balcony during ‘Car Radio’. Nothing will quite beat the finale though, as both took to the crowd with drums, held up only by their fans as they pummelled their way through ‘Trees’ and explosions of yellow confetti filled the venue, and we’re still finding pieces of it now. To celebrate turning 10, Absolute Radio threw one hell of a birthday bash at O2 Shepherd’s Bush Empire. Headlined by Manic Street Preachers, with George Ezra and Blossoms also making performances, it was an intimate but extravagant party to mark a decade as one of the UK’s best radio stations. Blossoms kicked off the night, almost a year on from their headline show here and showed just how far they’d come since. Man of the moment and the official voice of summer, George Ezra had everybody grooving to tracks from new album, Staying At Tamara’s and laughing along to his hilarious anecdotes from his time in the studio, “I ended up buying a bottle of rum from a man in a park… don’t judge me”. But it was Manic’s headline performance which truly stole the night, giving new album Resistance Is Futile some stage time, whilst also cramming in longstanding favourites, ‘A Design For Life’ and ‘If You Tolerate This Your Children Will Be Next’, they even managed to squeeze in a cover of The Cure’s ‘In Between Days’. A triumphant night all round and we can’t wait to see how Absolute Radio celebrate next time. Irish group, Picture This returned to London this month for a headline show, which sold out almost immediately. From the very beginning their performance was a joyous affair, as they performed new cuts, such as latest single, ‘When We Were Young’ as well as favourites from their self-titled debut album. Confetti was clearly in no short supply in London this month, as Picture This scattered it over their fans, one of whom enjoyed it so much, he decided to invade the stage. Fortunately, the band found it hilarious and after sharing a few hugs, the invader was lowered off by security and left to enjoy the rest of the show alongside everyone else. Never a dull day. Oxford locals, Low Island have been steadily making a name of themselves over the past year, gaining support from BBC Radio 1 and playing established festivals like Sound City and Dot To Dot over the summer. Taking to their hometown for a headline show, there was a buzz in the venue only felt when a band are on to something good, and Low Island certainly are. Taking their 21st Century influences and wearing them with pride, their sound is every bit danceable as it is emotional, encouraging the crowd to get lost in their music and let their bodies move. The encore was a particular highlight, as they performed a beautiful ballad with just a piano. It was so quiet you could hear a pin drop, before the rest of the band returned to the stage for a euphoric finish. Keep your eyes on this lot, you’ll be seeing a lot more of them in the near future. Nines has become one of the most important voices in the UK grime scene this year and following the release of his second album, Crop Circle (and its accompanying film), he performed for not one, but two nights at O2 Forum Kentish Town. For such huge shows, Nines wasn’t going to do something small, decking out the stage in London-inspired props, including Big Ben and the London Eye, as well as a DJ Booth covered in ice (in honour of the Ice City Boyz). As soon as he stepped foot on the stage, chaos ensued, mosh pits opened and bodies were flying, only emphasising the adoration felt by his hometown crowd. Of course, it wouldn’t be complete without some special guests, though, with AJ Tracey, Not3s, Yung Fume, Suspect, Skrapz, WSTRN’s Haile and Hardy Caprio all making appearances. Okay so stick with us here, but there’s this tribute band called Elvana, who cover Nirvana songs with a twist of Elvis and it’s BRILLIANT. They’ve already toured the country a number of times and thrown the biggest parties at festivals over the summer and this month saw them bringing more of their ridiculousness to our venues. Sauntering onto the stage in their outstanding costumes, the band thrashed, swaggered and riffed their way through Nirvana hits like, ‘Smells Like Teen Spirit’ and ‘Heart-Shaped Box’ whilst the crowd sung along to every word. Give it a go sometime, you just might have the best night of your life. Some people like to spend their Sunday’s eating a nice big roast or falling asleep on the sofa, but not Glasgow folk. No, for this particular Sunday swarms of metal fans headed for a bludgeoning night of riffs with Halestorm at O2 Academy Glasgow. Using the night to show off much of their new album, Vicious, it was a full-throttle celebration of this new chapter in the band’s career and the crowd adored the new tracks just as much as the old favourites. 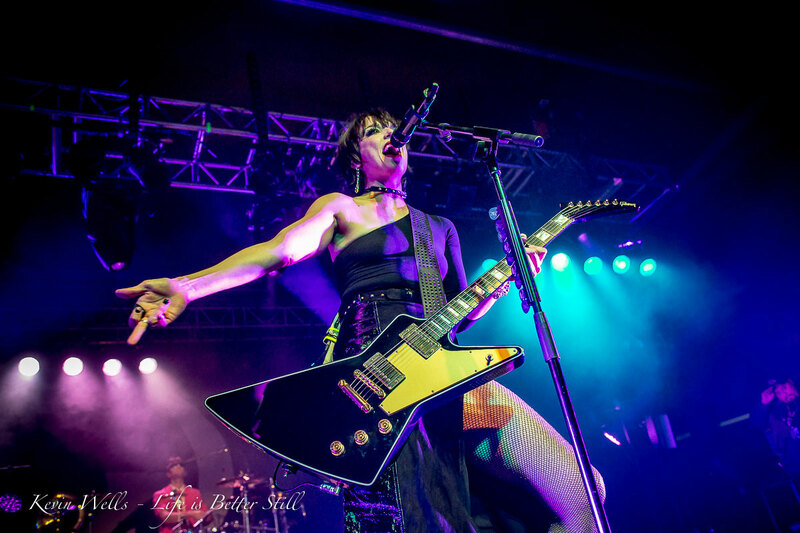 Epic guitar solos, plenty of head banging and Lzzy Hale’s astonishing vocals were the perfect reminder that rock and roll is still alive and well, and there were definitely some sore necks come Monday morning. Ahead of their tour with State Champs, Seaway put together their ultimate pop-punk playlist, which you can check out below. Want to see what other pop-punk gods we've got visiting our venues soon? Take a look at our guide here. With so many huge bands in and out of our doors, it’s easy to forget those bands that are out there, tirelessly working their way up to the top who deserve your attention. This month, we’re putting the spotlight on on dark, dreamy-pop four-piece,Swimming Girls.